Updated 12-27-16. 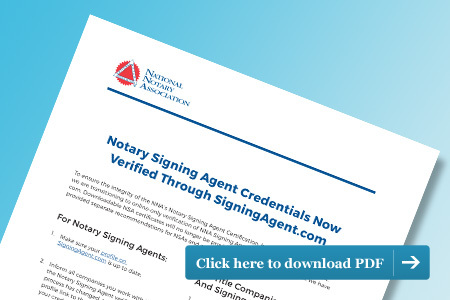 Starting in January 2017, the NNA is transitioning to a new proof of certification system for Notary Signing Agents, which will remove the need for NSAs to provide physical certificates to verify their credentials. Instead, Notaries who have been background screened or certified through the NNA will provide companies with a URL link that will be used to confirm their credentials through SigningAgent.com. The online verification method has always been available, and many companies rely on it today. 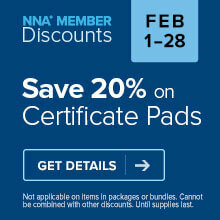 Because of its superior reliability and efficiency, the NNA will discontinue providing downloadable certificates in 2017 and will confirm NSA credentials online only. To accommodate companies asking for verification of Signing Agent Certification Credentials, NNA Certified NSAs can send them a direct link to their SigningAgent.com profile. This allows the company to access all of the NSA's profile details quickly and easily. NSAs can access this link in their "My Signing Agent Profile" section of NationalNotary.org. Because online verification removes the need for Signing Agents to print and submit a physical certificate, Notaries and companies they work with have less risk of a printed certificate being stolen, counterfeited or altered by a dishonest third party. It also makes the credential-verification process easier and more secure for NSAs, lenders, title companies and signing services. The NNA will be working closely with Notaries, signing services, title companies and lenders between now and January 2017 to ensure this transition is as smooth as possible and does not disrupt Signing Agents’ ability to work. Hello David. Different companies may have different procedures for verifying a Notary's credentials. You would need to contact an individual company to find out their preferred procedure. If you have a SigningAgent.com profile, the profile will show whether you have completed the NNA certification course and are currently background screened. This is an excellent idea. We have been asking the NNA to implement this for the last couple of years. I know several NSA's that were becoming frustrated with the redundancies of the various Signing companies when the information was online the whole time. Thank you NNA for stepping up and backing your members. I will not use the NNA in the future. I will use a certification agency that provides a hard copy of my credentials. I'm afraid I don't like this and don't want to be forced to participate! How I send credentials to a company is usually THEIR choice, not mine, and this will not make it any easier. It might be good for an alternative, additional, way to send credentials, but as the ONLY way it will not be good for any of us. This will not speed up, but slow down, the verification process for many signing professionals and companies. Most anytime some company, including NNA, limits users' options to only one, it is a cost-savings only for them, not us. The signing agent is paying for this, they should be provided a hard copy. We still have to send a link, many companies expect us to be able to upload our credentials directly to their site, I doubt they are going to like the extra work it creates for them. This will be so much easier! I am so tired of emailing or faxing my certification form each year. Now I'll just email the link to all of the companies I do business with and be done with it for the year. Easy Peasy! How do I get to the link,to provide the info. Hello. NSAs can access this link in their "My Signing Agent Profile" section of NationalNotary.org. I think this is a great idea especially when it comes to securing ones credentials, however, I also agree with many who are asking for an alternative way of verification i.e. downloadable access of ones credentials. It's the signing agent who is paying for this service therefore the NSA should have the option of soft copy vs hard copy or BOTH. I like to have a certificate that I can send to companies. I agree that we are paying for this service and we should be given a choice of soft or hard copy. Hello Mae. Your Signing Agent certification is separate from your commission renewal. If your certification is still current, you should not need to re-certify it until it expires. Showing my ID and Credentials is the first thing I do at a signing and is the first step to building confidence with the signers that I am qualified and authorized to do their signing. Please continued to make my NNA credentials available to me to show to signers. Thank you. REALLY NNA? REALLY? I WANT MY HARD COPIES OF ANYTHING I PAY FOR. I prefer to have a choice to be able to download my certificate. CERTIFICATE. I want a color hard copy of my certificate. Your new policy might be a cost savings to the NNA organization; however it makes the process more time consuming for the Notary and for the vendor. Why not do both? WEB SITE. 1. Increase the SEO on the web site in major search engines. 2. Put e-mail and phone links on each page of the website. 3. Make it easier for the consumer, user, member to access information on the NNA website. The result will be more business activity of the members and probably more members and a higher retention rate. Get busy and Do It! I live in Houston, Texas. I just became a certified notary, and how do I sign up for a signing agent job?! My profile is not completely updated in your new website and I was not able to view my own certificate. please advise. Hello. If you are having problems with your profile, please contact our Customer Care team at 1-800-876-6827 for assistance.